The Goodland Bee Supply Beehive Smoker is affordable, durable and does its job well. 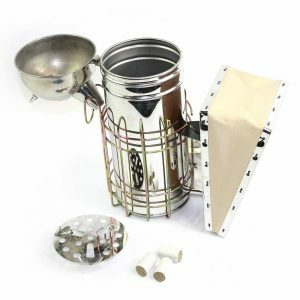 The Goodland Bee Supply Beehive Smoker comes with 3 packs of bee smoker fuel and is made of stainless steel. The smoker packed with an 11-inch smoke chamber which is very effective in smoke generation. Is this bee smoker worth getting? Let’s check it out. The bee smoker is made from polished and welded stainless steel. The stainless steel used in its construction is strong, durable and long lasting. There are perforations on all sides of the smoker to allow for optimum airflow in and out of the smoke chamber, so as to increase smoke production. The smoker contains a welded metal fall and heat shield that keeps the heat trapped in and optimizes smoke production, while making the exterior mostly cool for easy carrying around and handling without the risk of burning your hands. The bee smoker has a removable internal burn tray which allows for easy cleaning of the smoke chamber. It also features leather bellows, welded fall, and a heat shield. The bee smoker comes with three smoke pallets. These are able to ensure that an adequate amount of smoke is produced. These smoke pallets are made from mugwort, which is the common name for a group of plants that belong to the genus Artemisia. They are aromatic plants which produce pleasant and slightly sweetly flavored smoke, unlike the choking and irritating smell provided by the smoke of some types of wood. I found the bee smoker very effective in generating smoke. The smoke produced was thick and had a pleasant sweet smell that doesn’t choke you. The bee smoker weighs 1.6 pounds (0.73 kilograms). The bee smoker measures 11.7 x 8.7 x 5.3 inches. Easily operated by both beginners and experts. Works effectively in producing smoke. The fuel included produces sweet-smelling smoke. The mugwort smoke produced by burning the pallets can produce a very mild psychotropic effect in human beings. There are floppy hinge at the sides. The Goodland Bee Supply Beehive Smoker is well suited for both beginner and professional beekeepers. The face that it comes with fuel is a definite plus. The Goodland Bee Supply Beehive Smoker is well worth your consideration. It is a quality smoker that comes from a reputable manufacturer and performs optimally during use. The bee smoker is well made, compact, easy to use and durable. It is great value for money.